Squash plants are notoriously productive and thrive with the right care. 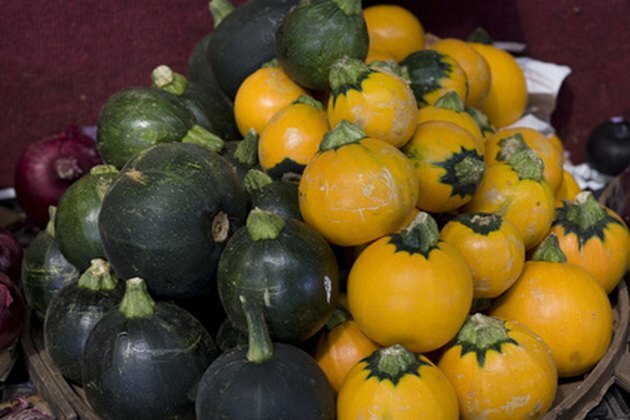 The squash family includes a wide range of plants from summer squash to zucchini, pumpkins and winter squash. Any fruit must start with a fertilized female flower, though, and only happy plants flower. Follow some important care guidelines to grow happy squash plants, encourage flowering and increase your blossom and fruit production. Squash plants flower and produce prolifically under the right conditions. Plant squash in full sun, in quick-draining soil and in mounds to promote good drainage. Squash plants require these elements to grow and develop and eventually flower. Water squash plants consistently every two to three days with at least an inch of water. Keep the soil consistently moist but never wet. Squash plants require water for leaf, flower and fruit production. Fertilize squash plants every two weeks with organic fertilizer to feed plants and promote blooming and fruiting. If plants don't receive enough nutrition, they won't be able to put energy into blooming or fruiting. Add a 2- to 3-inch layer of mulch or compost to the soil of a squash plot. Mulch or compost will discourage weeds, maintain soil moisture and protect the plants from pests. Protecting the plants allows them to put more energy into blooming. Increase water and fertilization as squash plants reach maturity and get ready to bloom. Squash plants mature at 45 to 50 days. Increase food and water at that time to give the plant more energy for blooming. Monitor the squash plants during flowering to harvest male flowers during blooming and possibly encourage new female flowers. Don't pick all the male flowers, because some are needed to pollinate the female flowers. Female flowers are small and have large oval ovaries at their base. Those ovaries become the squash and can be tasty treats if they're picked when they're young and fresh.